We love Oobleck, and we love rainbows. One of our favorite activities is making an Oobleck rainbow and experimenting with color mixing. Directions: To make Oobleck you simply combine equal parts of cornstarch and water. If the mixture is too runny, add cornstarch. If it's too thick, add water. 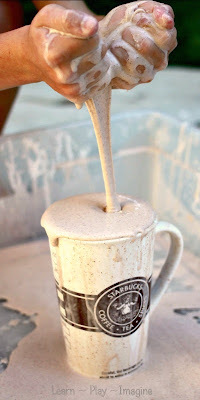 Before adding water I suggest working it between your fingers to make sure all the cornstarch clumps are mixed in. To make our rainbow Oobleck I added liquid watercolors to pitchers of water. Food coloring will also work. We have these pitchers. They provide little hands plenty of pouring practice. I used yellow, red, and blue watercolors. The boys took turns adding colored water to each container of cornstarch. We have done many hands on color mixing activities, so before adding the colors I asked them which colors they thought would make green, orange, and purple. They each made a guess, and we decided on a good combo together before mixing each color. Then the fun part began. They dug their hands in and mixed up the Oobleck in each dish until we had a beautiful rainbow. For some reason I couldn't convince them to stick to the correct order of colors. At least we got all the shades right. Keep in mind as you are adding color that the white base of cornstarch will make all the colors pastel. If you prefer more vibrant colors quite a bit of coloring is needed. 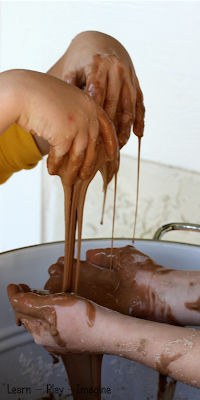 Oobleck is a non-Newtonian fluid meaning it's both liquid and solid. If you haven't yet experienced scooping up a ball of Oobleck then watching it drip through your hands, go get a box of cornstarch and try it! Every time we make a batch I play right along side the kids. Before long, the boys start to explore and combine different colors to see the results. One of the wonderful things about the consistency of Oobleck is that it doesn't blend together too quickly. For more rainbow activities follow me on Pinterest. Trying this tomorrow:) How do you make out glow? You need a black light to see the glow. Have fun!